Hi all! This morning starts a few fun filled days of a new clear release over at Some Odd Girl and I can't wait to share these new images with you! 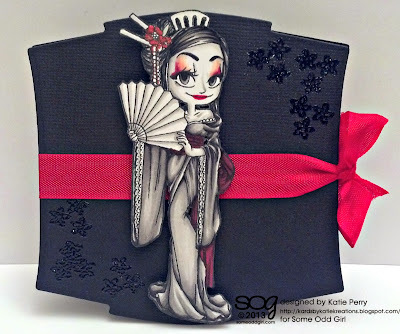 First up is Geisha Kaylee and she is so not only gorgeous but so much fun to color :) In fact if you check out the Some Odd Girl blog not only will you get to see the other fabulous projects that the new team at SOG came up with but, as an added bonus, I did a speedcoloring video of how I colored up this little beauty in back and white with a touch of red. So pop on over and check it out or stop by the Some Odd Girl YouTube page to take a look! And, because I'm sure you're going to love her as much as I do, don't forget to pop on into the SOG store to pick her up for yourself :) Hope you like my card and vid- thanks so much for stopping by to visit me and stay tuned for more of this release in the next couple of days! Love this black/white with a pop of red! Genius!! Gorgeous work my friend! Woooow! ... totally speechless here! This is mindblowing ... love the white/black/grey combo! And the eyeshadow ... awesomesauce!!!! You totally rocked this new SOG image!! Amazing!! I love the black and white and the eyeshadow. It looks like she has flames on her eyelids. Katie, this is stunning. I love the image and the colours and your colouring are fabulous. A very striking card. Very Cute Katie...i loved your speed coloring over on Some Odd Girl page. This is awesome! Love this card! It's a different style for you and I love it! Just goes to show you that no matter what you create it is amazing! Lovely colors! Beautiful shaped card. Thanks for taking part in the CAS on Sunday challenge! Such a beautiful shaped card and what a great image. Thank you for playing along with CAS on sunday.